Only a few days after the arrival of kids' channel Kochu TV of the Sun Network, one more channel is entering the battleground of Malayalam television industry. Mazhavil Manorama, the new general entertainment TV channel from the Malayala Manorama group is to be telecasted from 31st October onwards. Though it had been expected to be launched during Onam, the launch was extended due to various reasons. The channel is the birthday gift to Kerala, as the management claims. Mazhavil Manorama has started its test transmission already. The logo of the channel had been already launched a few months back ceremoniously. It is designed by Ian Wemliton, the creative head of Red Bee Media and consists of an 'M' which carries all the colours of a rainbow as if floating on a palette. 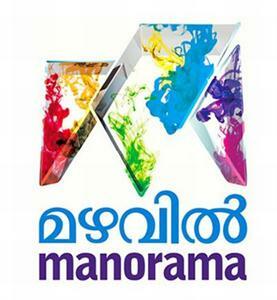 The Manorama group has already found a place in the TV media through their News channel, Manorama News, floated in 2006. They are expanding the network with the launch of Mazhavil Manorama. Manorama group is the stalwart in the publishing arena owning Malayala Manorama, the most circulated Malayalam daily, dominating women's magazine 'Vanitha' and a few others among the publications. They also have made their presence in the FM Radio telecasting with their channel Radio Mango 91.9.Now they are eyeing a significant spot in TV media too. The channel is headquartered at Kochi. It will be available in the Indian subcontinent and Middle East. Eventhough we have to wait for a few days to get a clear view of it, it is reported that Mazhavil Manorama will be coming with a bunch of entertainment programmes targeted at all kind of audience. It will have the programmes equally dedicated to kids and elders. Their portfolio includes serials, film shows, family shows, movies, reality shows and more. The initial selection process of their musical reality show named Josco India Voice has been completed recently. Its judging panel includes singers Shankar Mahadevan, Sujatha and Srinivas with pianist Stephen Devassy. The show has also got a Pakistani singer among the 25 participants. Shweta Mohan, Revathi and Rohini are among the hosts of various shows. The prominent mini/big screen directors like KK Rajeev, Viji Thamby, Kaladharan, A M Nazeer and R Gopinath are doing serials for the channel. The channel has roped in the famous anchor R Sreekandan Nair as one of the show hosts. He is also the serving as one of the directors of the channel. Regarding the movies, Mazhavil Manorama has acquired the television rights of a few latest movies including The Thriller, Cocktail and Marykkundoru Kunjadu. They have also bagged the rights of and some Old ones like Runway, Rasikan, Aparichithan, Thaskaraveeran, Gourishankaram, Hridayathil Sookshikkan, Annorikkal and more, which rarely get telecasted in channels. They are keenly looking to get a couple of fresh movies more to telecast. The entry of Mazhavil Manorama will raise the competition in Malayalam television industry which is dominated by the channels like Asianet and Surya TV. Mazhavil Manorama, new entertainment channel from Malayalam manorama will be launched this onam adding more colours to the taste of malayalis all over the world. Read the complete story of Mazhavil Manorama, the entertainment channel from Malayala Manorama. Mazhavil Manorama, new entertainment channel from the malayala manorama family has launced the channel logo. The log of the channel Mazhavil Manorama was designed by Red Bee Media, England. Read about more about the channel logo. Manorama’s entertainment channel Mazhavil Manorama’s launch date, frequency, symbol rate and logo are given here. We deals with the official launch date of Mazhavil Manorama channel along with complete satellite information and tuning procedure of Mazhavil Manorama’s like frequency, polarity, symbol rate and the name of the satellite.